Between perfectly bouncy locks and flawless skin, society today obviously values a pretty face. This beauty ideal is nothing new, but it has been redefined throughout history. Pressure to be beautiful in Renaissance Italy was especially cruel. In essence, Renaissance people were the ultimate victims of the Cinderella tale. Wicked and unchaste women were ugly. Virtuous women were beautiful. Are you a Renaissance Beauty? You might have been Leonardo’s muse in another life. But before you get too cocky, remember that you would be positively washed-up by the age of 30. Hope that day has not come yet. You may need a little help with some tweezers and lead make-up. 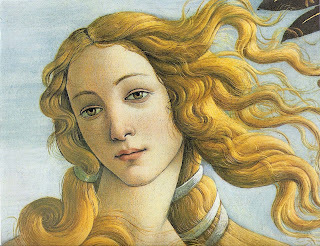 Stay tuned for a future post on Renaissance beauty secrets. Sheeesh…. You sure got hit with the 16th century ugly stick? Don’t worry. Perk up that Hapsburg chin and make sure to read the future post on Renaissance beauty secrets. Beautiful and virtuous women had a fair complexion with blond, curly hair, a long elegant neck and chestnut brown eyes. Their eyebrows were perfectly arched and thin and their foreheads should be twice as wide as they were high. (plucking helped). Our muse should also have a long, slender nose but it should not turn up at the end and her lips should be shaped like a delicate rosebud. She should have perfect teeth, but should never reveal them fully to her suitor. If she had bad teeth then she should keep her mouth closed at all times. Ha! Apparently I'm a renaissance beauty, except for my little nose. Oh well. Can't have it all. And, yes, I WILL be cocky about this, thankyouverymuch. I would have had to hope for a huge dowry because I am definitely not a Renaissance beauty. ah well. gosh. i am the ugly stick.. *cries cries*.. lol..
Aw nutz! Here I was thinking all this time that I would have fit in so much better during the Renaissance, but I guess I wouldn't have done much damage back then either! I can't win, LOL! thank God it's the 21st century. barely scored a 10!